For daytime cold and flu symptom relief of nasal congestion, sore throat, cough, fever, headache, and minor aches and pains, the day restarts with DayQuil. Introduce Your Cold Symptoms to Powerlessness Help get your power back and enjoy the day how it was meant to be—without cold and flu symptoms keeping you in bed. 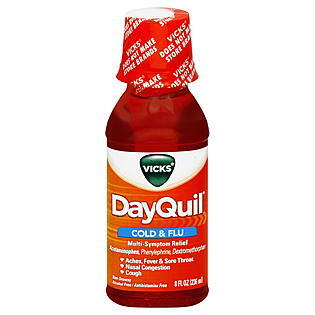 It begins with the non-drowsy, multi-symptom cold and flu relief of Vicks® DayQuil® Cold & Flu Liquid medicine.